"[Feldstein's] relatable voice makes getting involved tangible for even the most novice advocates. There's no shortage of animals in need, and the author provides countless ways to transform belief into action." "In the compelling style of a really good writer, and covering every aspect of animal exploitation and alternatives, this book tells us what’s wrong, what we can do about it today, and who’ll benefit from each action. After reading this, I feel uplifted, empowered, and motivated — grateful even, knowing how much we can do." "Here are 259 pages of great news: we animal lovers have SO much power! There's SO much we can do! Whatever your passion, whatever your budget, whatever your schedule, you'll literally find thousands of new ways to make a difference for animals, or make what you're already doing more effective. This book belongs on every animal lover's shelf--and it's a particularly great gift for young people who are on fire to save animals but are unsure where to start. Hooray!!" "Anyone who loves animals will want multiple copies of this insightful book to give to friends. It is really a treasure—sensible, readable, non-dogmatic, filled with innovative ideas and helpful suggestions, and brimming with humility and humanity. 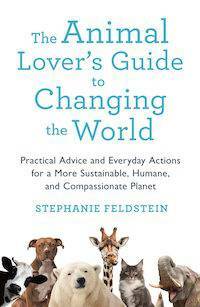 I can't imagine any animal activist not learning something new and essential from Stephanie Feldstein." —Jeffrey Moussaieff Masson, bestselling author Dogs Never Lie About Love and The Face On Your Plate. "This is exactly the book I was looking for when I was a nascent animal advocate 27 years ago and needed guidance and inspiration, and it's exactly the book that will be the light for many aspiring advocates and budding ambassadors of compassion." "Nonhuman animals need all the help they can get, and Stephanie Feldstein's new book is just what is needed to give them the most compassionate and humane lives possible in the wide range of venues in which other animals and humans meet. Clearly written and appropriate for a global audience of all ages, I hope this practical guide with simple and easy-to-do action alerts winds up on the bookshelf of everyone who wants to help other animals live in peace and safety." “Whether you’re passionate about protecting wildlife or you want to be part of the generation that ends factory farming, you need to read The Animal Lovers Guide to Changing the World. Feldstein provides dozens of easy, practical actions each of us can take to make the world a kinder place for human and nonhuman animals alike." "This uplifting book is full of simple but meaningful actions that show animal lovers how to become animal advocates. Anyone whose life has ever been enriched by an animal now has the opportunity to pay the favor back." "Feldstein’s important new book provides practical ways for readers to improve the world around them. This is an important new contribution to our literature on activist strategies." Stephanie Feldstein is the population and sustainability director at the Center for Biological Diversity, where she leads the Center's work to highlight and address threats to endangered species and wild places from human population growth and overconsumption. She has more than 20 years of experience advocating for animals and the environment.